Acacia Technologies is a US company. They have a patent on the idea of sending streaming video over the Internet. The patent has been granted in both the US and Europe. If your organization wants to use streaming video on your web site, you must get a patent license from Acacia. Otherwise you'll be infringing. Acacia offers patent licenses to companies, in return for 2% of their gross turnover. If you refuse, you’ll be sued. Acacia has won several lawsuits against companies that tried to oppose them. Through a court injunction Acacia got the Internet Service Providers to shut down sites that did not succumb to their demands. Note that we are not talking about any software that Acacia has sold. Acacia doesn’t sell any software. All they sell is a promise not to sue you if you show streaming video. The software to actually achieve this, you’ll have to get elsewhere. If you think this sounds unreasonable, you are not alone. But these are the consequences of legislation that allows software patents. Acacia is based in California, and started its career by suing American corporations. In the US, software patents are a long established fact. Here in Europe, the situation is more complex. The European Patent Convention EPC explicitly prohibits patents on computer programs. Despite this, the European Patent Office EPO has allowed itself to be influenced by the US, and grants software patents. The legal value of these patents is uncertain, as it is up to the national courts to decide if they are valid. The EU is now working on a directive that will decide if software patents should be allowed or not. But Acacia has already started sending letters to European businesses, including some Danish ones. If the coming EU directive says “yes” to patents on computer programs and business methods, Acacia will have the law on their side. If the directive says “no”, we will hopefully be spared the presence of companies like Acacia here in Europe. Acacia started out in 2002 by demanding royalties from a number of US adult content providers, who were using streaming video on their sites. To the extent that any of them could afford to take the case to court, it was a little easier to gain the sympathy of the court against that kind of opponent. In this way, Acacia could get both valuable precedence and a welcome addition to the war chest. Acacia persuaded the court to block the Internet connection for the sites that were ignoring the demand to sign a patent license. Even large corporations, like Hustler Magazines, have been forced to take a license. But according to an article at ExtremeTech, Acacia views the adult industry as just the tip of the iceberg. After their legal victories they have also started to target other businesses. American universities that are using streaming video for teaching have received letters demanding that they get a license. But also companies like Radio Free Virgin, which is an online radio station that is part of Richard Branson’s corporate empire. Robert Berman, senior vice president and general counsel at Acacia, says that the patent also covers streaming music online. Acacia claim that their patents cover all kinds of streaming broadcasts, whether it be over the Internet or through more traditional channels, like cable or satellite. - Content providers such as major studios and services that wish to provide them over the Internet could also be included. Even on-demand services in hotel rooms have been contacted by Acacia. In fact, the on-demand movie industry was contacted even before adult webmasters, Berman said. So far, the targets have been American companies. But the patent has now been granted in Europe. The European patent number is EP0566662. Acacia have started contacting Danish businesses, primarily adult sites. The cost for a patent license is 2% of the gross turnover. But trying to fight the demand can be even more expensive. - We're not willing to put anyone out of business; we're not looking to change anyone's behavior, Berman said. If people feel that this is something they need to challenge in court, fine. But if they challenge this in court, 75 percent of the people will likely spend more in court fees than they'll spend in royalties to us. If they're successful, they'll recoup those fees. If they're not successful…, Berman shrugged. Read an example of a letter from Acacia. Also read an extract from Acacia’s terms of license, and see if you find them reasonable. Is this good for Europe? The outcome of Acacia’s European lawsuits will depend on whether the EU decides to legalize software patents or not. Right now, the issue hangs in the balance in Brussels. The European Parliament has adopted a proposal for a directive that says no to software patents. If this proposal is passed, Acacia’s patent will be worthless, and they will no longer be able to threaten European businesses. But the Council of Ministers has adopted a different proposal for the directive. This proposal contains a number of loopholes, which mean that patents on computer programs will get legalized in practice. Then we’ll see many Acacia style companies. Because it’s not just streaming video that somebody has a patent on. 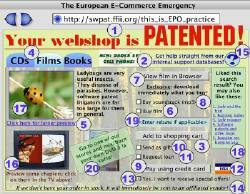 The European Patent Office has already granted 30.000 software patents. This illustration shows an imaginary web commerce site with normal functions. It infringes on 20 different, already granted, software patents. If software patents get legalized, the proprietors of these patents will be able to join Acacia in its lucrative business. And even if you manage to avoid these 20 patents, there are 30.000 more to consider. But the good news is that something can be done about it. The European Parliament will vote on the Council’s proposal for a patent directive some time during the autumn of 2004. The parliament has already said no to software patents once. But it’s not yet certain what the outcome will be next time. For this reason, it’s important that European businesses get involved in the issue. This is not something that just concerns companies within the IT industry. All businesses that use computers in any way are affected. If the Council’s “yes” to patents on computer programs and business methods is adopted, it will become very expensive. But the time window to do something about it is open now. Contact FFII.se for more information. The text is public domain.